In these past few weeks, we have spent a lot of time chatting with local and small businesses, ethical brands, and nonprofits. One trend we've noticed consistently is challenges in growing your community - whether that's finding partners to work with, organizations to collaborate with, or finding new clients + buyers. So, we've rounded up some ideas to help you maximize the entrepreneurial + do-good community, with the help of some of our own friends! After reading Half The Sky by Nicholas Kristof + Sheryl WuDunn years ago, I first realized that for girls around the world, access to a quality education changes everything. Since then, I've been a huge advocate for organizations and issues that empower women + girls around the world, specifically in developing countries. And that's why I'm so excited to share about Kurandza and their newest campaign, #IStandForGirls. Kurandza is a nonprofit social enterprise that invests in the future of women in Mozambique, and their goal for September is to send 100 girls to school. Last week, we had the pleasure of attending The Yellow Conference. The Yellow Conference is an annual event, bringing together 500 female creatives interested in doing social good. And what we loved most were their diverse speakers and informative talks. 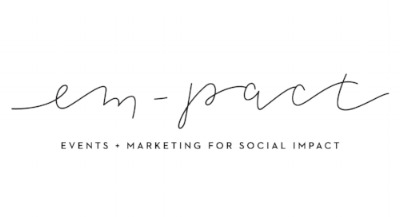 We came away with 5 key takeaways that will be resonating with our team at em-pact for the rest of this year to say the least.